If you are looking to build HTML5 applications in Visual Studio and would like to learn how to do it quickly and easily using the best practices, then we have great news for you. 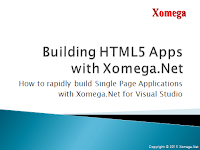 We have just published our latest video tutorial that walks you through the entire development process with Xomega, and shows you SPA architecture and many useful features that come with our XomegaJS framework. After a quick introduction to Xomega, we'll show you how to build a vanilla HTML5 application with powerful search and details views from an existing database table, and then use iterative process to enhance it with new features, such as static and dynamic enumerations, cascading selection, etc. Finally, you'll see how easy it is to generate professional documentation on your service and domain models right from your Xomega model. Please enjoy our new video, and get back to us with any questions or feedback.